What do you want from a food delivery service? August 2018 update: Delivereasy has suspended its Auckland operation. It plans to resume the service next year. Gone are the days when pizza was the only player in the delivery game. Now you can open an app and get Chinese, Indian, burgers, Malaysian, or even a steak, direct to your door. But when you’re hungry the last thing you want to do is check every single app to find what you want, so which is best? We trialled three food delivery apps – Delivereasy, Uber Eats and DineIn – to find out. These delivery services offer various food options, all through a single portal. Just enter your address and you’re shown all the restaurants available to you. Depending on your location, there may be dozens or just a handful. After choosing a restaurant, you go through its menu and make your order (you can also add or remove ingredients). Payment is handled through the app or website, and then you sit back and wait for the food to arrive at your door. Uber Eats and Delivereasy offer delivery and ordering services so all your interactions are with them, not the restaurant. DineIn and Menulog don’t have drivers, instead affiliated restaurants provide their own. Both services include restaurants that don’t offer delivery, with pick-up only. Selection: Does the service have a wide choice of food? Not just the number of restaurants but also a good range of cuisines. A food delivery service with 100 restaurants is good, but not if they’re all pizza places. We want variety. Ease of use: How easy is the app/website to use and how simple is paying? Can you quickly find what you want? Is it confusing to select menu items and request changes (adding/removing ingredients)? Reliability: After you’ve ordered, how fast does it get to you? Can you see how far away your delivery is, or do they update you on delivery times? Does food arrive at the right temperature? Has it been scrambled in transit? Cost: How much does it cost? Is it much more than just getting it yourself? We chose Uber Eats, Delivereasy, and DineIn. Our criteria were that services operated in at least two cities and had more than three restaurants available to order from. So JSS Food, which specialises in Asian food delivery in Auckland, missed the cut. Similarly, Food Ninja only services Wellington. Menulog is available in four cities, but when we tried ordering in central Wellington, we were only shown three restaurants – two were closed and the third was pick-up only. We made a series of orders from each food delivery service. All our orders were for delivery as close to 6pm as possible (exact timing isn’t always possible). We did this on consecutive week nights and from different restaurants (in the same area) to an address in central Wellington. We noted when the food arrived and the state of the food when it arrived. We then ranked each on a scale of A-F for our criteria. To assess selection, we entered central city addresses and noted the available restaurants. This isn’t necessarily what will be available further out in the suburbs but indicates the breadth of a service. For ease of use, someone unfamiliar with food delivery services tried using the apps and websites (where available), going through all the steps to carry out an order. It became apparent that reliability is a random variable. There are several factors at play – from how busy the restaurant is, to if there are drivers in the area, to traffic conditions. This isn’t to say these services are unreliable. We had deliveries that arrived ahead of schedule and with the food in excellent condition. So any issues we had with the delivery services were just a result of the chaos from trying to get hot food from one part of town to another. But what you give up in reliability, you make up for in convenience. While we rated our experience, it didn’t factor into the overall score. 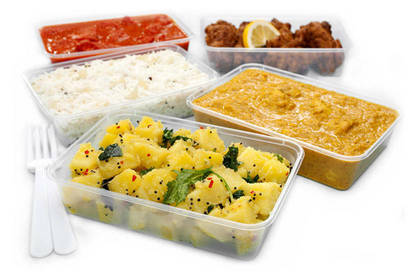 Curries are the most resilient food to transport. Even if arrives a little cold, it’s easy to reheat. Noodle and rice dishes aren’t too bad. Roast or barbeque meat and vegetable dishes do OK, though may be a little “sweaty”. Burgers, fried food, fish and chips are the worst. Burgers often arrived looking dishevelled, and are a pain to reheat. Fried foods, especially dumplings, ended up soggy and chewy. Something that didn’t factor into our assessment is delivery vehicle. Uber Eats delivery people can use a car, bike, scooter or motorcycle, while Delivereasy only uses scooters and motorcycles. Cars need more room to park when picking up and dropping off. This can be an issue in areas where there’s not always a convenient place to stop or where there’s higher density traffic. 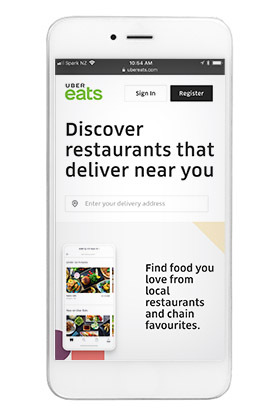 Uber Eats allows drivers to deliver from one restaurant to multiple locations. However, if you’re the last place to get a delivery, it could be a long wait for your food. Rather than a flat fee, delivery charges for the services depend on where you live. A delivery to Newtown in Wellington may have a fee of $7 added to it, while just down the road in Island Bay, you’d be charged $10. There is no strict per-kilometre charge. Services such as DineIn deal directly with the restaurant. This means the delivery fee can be waived if you order a certain value of food. However, they also have minimum orders. Uber and Delivereasy also have small mark-ups on menu items. So it’s not as cheap as eating in the restaurant. Mistakes happen, but when you’re “hangry”, waiting for food, you need to be able to deal with those mistakes. With Uber Eats it can be done in the app. There are steps to lodge your complaint. This can be done during delivery as well. After your order you can rate the driver, and each item in your order, with a thumbs up/down. We complained about a pizza delivery (see Hell vs Hell) and received a $10 credit. Outside of this trial, we had orders partially and fully refunded due to extreme lateness or missing items. The refunds are always done as credit and don’t take longer than a day or two. Delivereasy has contact phone numbers for each centre they service as well as a catch-all support email. The numbers aren’t toll-free but will get you resolution quicker than using the email address. We had a delivery arrive without some items, so we emailed Delivereasy. It took almost a week and multiple reminder emails to get a refund, which came with a code for $10 off our next order. The refund went back directly on to the credit card we paid with. As DineIn is a payment-and-ordering system rather than a delivery service, it says to deal directly with the restaurant. This is similar to what you would do if there was an issue with a purchase on TradeMe. However, if there is no resolution then DineIn steps in. One dinner order we put through was late, but the restaurant texted twice to update us on this and offered a free bottle of Coke as an apology. Despite having its own delivery service, Hell Pizza is also listed on Uber Eats. We tested which version of Hell was better by making two orders through the same Hell location: one via Hell’s website and the other through the Uber Eats app. We pre-ordered both sets of eight pizzas to be delivered between 6 and 6:30pm. The Uber Eats app messaged us at 5:50pm to say the order was being sent through. At 6:30pm the order was picked up by a driver and it arrived at 6:50pm. We noticed pizzas weren’t stored in an insulated bag, and the food was noticeably cold when it arrived. The regular Hell Pizza delivery arrived at 6pm and the pizzas were hot and fresh. After sending a complaint to Uber Eats through the app about the $160 order, we received a $10 credit on our account. Delivers in: Auckland, Wellington, Hamilton, Tauranga, Dunedin. Delivery fee: $8 to central Wellington (changes depending on suburb), plus item mark-ups. No minimum order value applies. The New Zealand-owned company delivers in five cities (with a list of suburbs covered). There were 66 available restaurants, offering many cuisines from Mexican to Malaysian, in central Wellington. The app and website are identical, and don’t have a filter function, but they have search bars to find a particular type of food or restaurant. Our tester found the website and app easy to use. You can only pre-order food for same-day delivery. 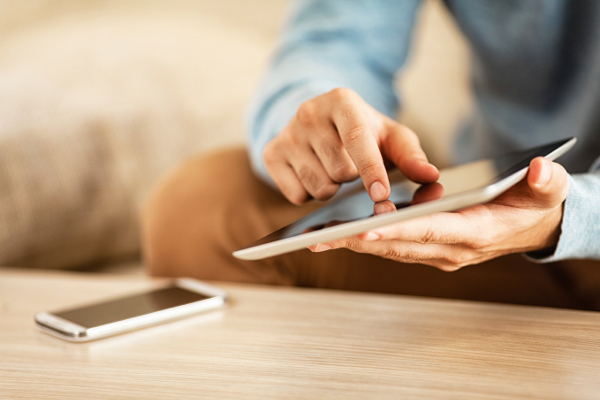 Once you have an account, you can link your credit card to it or enter your details each time. Delivereasy lacks a formal route for complaints. The delivery person will text you if the order is late. We found a lot of variation in the state of the food when it arrived. It wasn’t clear which orders had been transported in an insulated bag. Delivers in: Auckland, Wellington, Christchurch, Hamilton, Tauranga, Dunedin. Delivery fee: $6 to central Wellington (changes depending on suburb), plus item mark-ups. No minimum order value applies. There’s no doubting how slick the Uber Eats app is. However, our tester became “lost” quickly when trying to change the delivery address and only found how to order in advance by accident. You can schedule an order up to a week in advance. The app will store the order and send it through to the restaurant 10 minutes before your scheduled delivery time. Uber Eats delivers to six cities, but doesn’t specify which suburbs it covers. There were 79 restaurants, with a great range of international cuisines, available for dinner in central Wellington. The app is based on Uber’s ride-share service. You’ll get notifications sent to your phone as the order progresses and once picked up you can watch the delivery vehicle on a real-time map. Uber Eats requires linking your account with a credit card or your PayPal. If anything goes wrong, Uber Eats has several ways to complain. After a delivery you can rate the driver and each item you ordered. You can also complain during the delivery or afterward. Available in: lists options in most areas of the country. Delivery fee: (changes depending on suburb). Minimum order value applies. Our tester found DineIn confusing. When searching for a cuisine type, the site and app listed restaurants that didn’t deliver and some that weren’t available through its service. For example, Hell Pizza was listed but it only gave us the phone number. It also has restaurants that have closed down. The search feature is infuriating. Rather than entering your address and seeing what is available, the site suggests, as an example, you type “Thai Ponsonby”, or “Thai Ponsonby deliver” to see delivery options. Once you have your results, filters on the side make it easier to narrow down. We found the simplest method was typing in the desired cuisine, then using the filters. Moreover, the app gives different search results to the website. This all leads to a poor user experience. DineIn lists restaurant options all over the country, giving it the widest spread. However, most are Indian, so variety is low. It had 18 restaurants available for delivery for dinner in central Wellington. While the website found 83, the rest were not available to order from through DineIn, didn’t deliver or had shut down. DineIn says to contact the restaurant directly if there is anything wrong with your order (it provides contact details). You’ll need to enter your credit card details for each order. For more on food delivery services, see last year's trial. We ordered the same four menu items from the same restaurant through Uber Eats, Delivereasy, Food Ninja and Menulog, asking our taste-test panel to rate the food on arrival.